Here’s the thing: I don’t watch televised sports. Ever. Well, maybe if the people I’m with are watching and we’re at a pub or in someone else’s living room, but even then I’m usually thinking about unicorns or what I read in Maclean’s that day or quietly getting drunk/trying not to fall asleep. When I’m at home alone, I do not turn on the TV to watch “the game”. Not for the CFL (go Riders! ), not for the NHL (go Canucks!). Never. I don’t know any stats. I don’t know anyone’s number. I don’t even know the rules. If this is true (which it is), how the hell can I claim to be a sports fan? Simple: I want the teams I am a fan of to win. When they do, I feel good. When the buses flash “GO CANUCKS GO” I get a warm fuzzy feeling inside. A feeling that tells me that despite all the things that make the citizens of Vancouver different and diverse, we can all rally around our team(s). Unless of course, you are a Saskatchewan Rough Riders fan (which I am) and the BC Lions are winning. Boo. 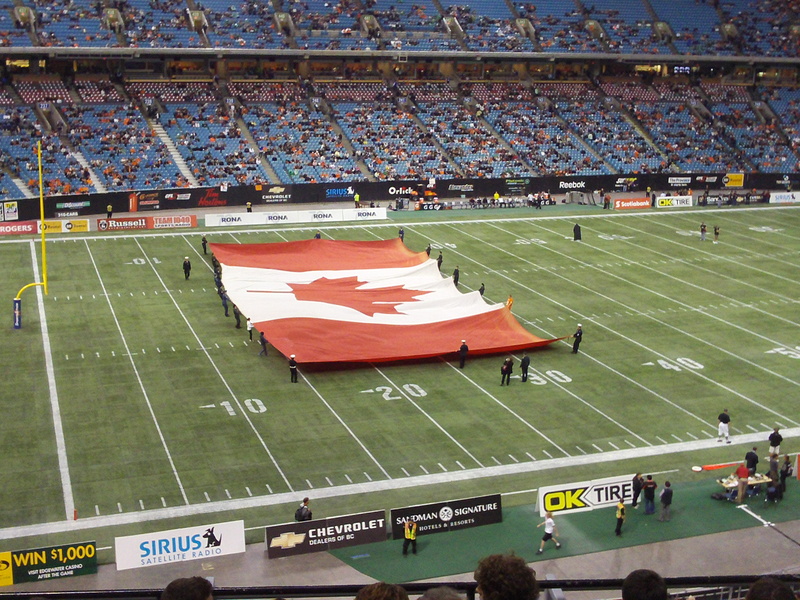 In 2009 I had the opportunity to attend my first CFL game with some friends. 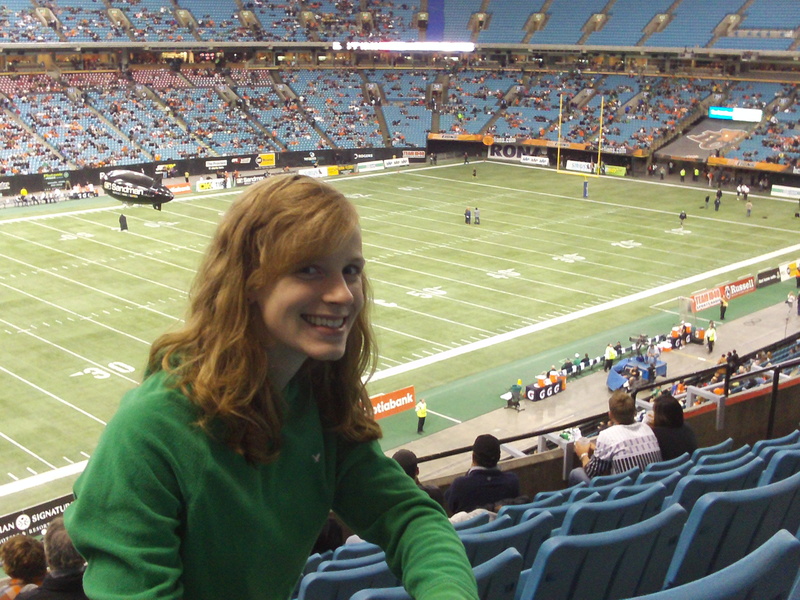 The Riders were playing the Lions and I was feeling a little conspicuous in my bright green sweatshirt. The closer we got to the stadium, however, the better I felt. There were green-clad Rider fans everywhere! Many were Saskatchewan ex-pats like me, but some actually drive/fly all the way from Saskatchewan to support the Riders wherever they play. Though we ultimately lost that game, we pulled off some kind of thrilling maneuver in the second half to tie it up and I recall being high-fived by a fellow Rider fan that I didn’t know very well and feeling really great about it. And then we lost. But still. That high five is what counts. When I was stuck in a long line at London Gatwick last May, waiting to fly back to Vancouver, the conversation moving up and down the line among Vancouverites was not about Iceland or the ash cloud (we were only delayed a few hours fortunately) or the lovely things we had seen in Europe. We were all asking each other if anyone knew how the Canucks were doing. It was a feather in my cap to be able to tell someone that we had just lost to Chicago and needed to win the next game to remain in the playoffs. As it turns out, we did not remain in the playoffs. But being able to bond with perfect strangers over something other than hating the airport is what counts. I think what really appeals to me about sports fandom is that it seems to be one of the last bastions of community, ritual, and tradition in an increasingly individual-centric kind of society. Gone are the days when the snowshoe dance/ husking bee/ box social was the event of the season for an entire neighbourhood. Gone are the days when everyone in a community belonged to the same clubs and wore their pins, ribbons, or uniforms with a sense of collective pride. In many ways, the loss of this kind of “group think” is very positive, especially for people or groups who had been traditionally marginalized or ostracized. Now the idea is that we should all be free to be who we want to be, and pursue our individual goals and dreams. This is all very well and good, but it can get a little lonely. I think we all crave something that unites us, something we can cheer for and be excited about and support, something that exists outside politics or religion or anything else that currently divides us. I think sports fandom has filled this hole. Think about it: the Stanley Cup playoffs are coming. At what other time of year do romantic partners and employers all over Canada endure the hideous/glorious ritual that is known as the “Playoff Beard”, clearly visible on the faces of hockey fans? In what other situation would the statement, “I can’t shave my hideous beard or my team will LOSE” not be considered totally ridiculous? While some believe sports fandom encourages drunken hooliganism (which I’m sure it does), it is also one of the last socially acceptable ways in which an increasingly “cool” society can publicly display their excitement and enthusiasm for something. Do you want to dress all in one or two colours? Wear a cape? Paint your face, or (gasp!) get a logo tattooed on your body? High five (or occasionally hug) similarly dressed strangers on the Sky Train? Is it for the team you love? Because if it is, it’s okay, and it’s awesome. Look Ma! I support an NHL hockey team! 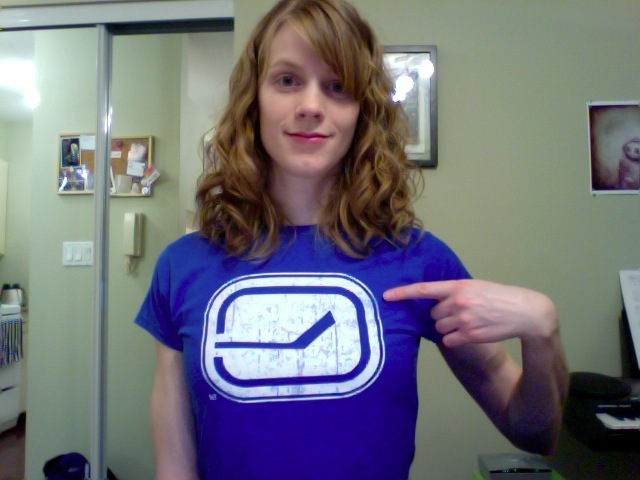 This is why, despite not having watched a single Canucks game this year, I recently purchased a Canucks t-shirt on a lovely spring day. This is why I donned the shirt on the next game day, even though I wasn’t going anywhere. I’m a lazy fan, sure, but at least I’m stylish. It’s not about hockey or football for me, or about the individual players or how well they play. It’s about an entire city getting behind something. It’s about communally cheering (or swearing), and being proud (or disappointed) together. And yes, it’s cliche, but it’s about heart. The collective heart of a group of people who all want the same thing is quite rare nowadays, and it moves me. To my artsy friends, I’m sorry. I know for all intents and purposes I act like I don’t give a crap about sports…but damn, do I ever want Vancouver to win the Stanley Cup this year. And you’re just going to have to be okay with that. After years of denial, I finally am. Thanks for the inspiration, Lindsay!